Rising Damp Treatment London – Dealing with rising damp in your home or commercial property. As if we needed reminding, we’ve been shown by Mother Nature in recent years that our humble homes and commercial buildings are simply no match for the stunning power of water. It doesn’t matter if it’s a major river that has flooded, an awesome hurricane, a tsunami… or a more pedestrian broken water line flooding your house or office, you need help fast before the damage to possessions as well as to the structures themselves becomes irreversible. If you suspect you have rising damp issues, contact us today and we will organise either a non destructive ultrasound and thermal imaging damp survey, or an invasive inspection with the latter plus camera probes and some more hands on lifting of floor boards or probing of the ground and wall – we will get to the bottom of your perimeter damp problems. Our primary service consists of attendance to assess the damp and diagnose the source. Sometimes what appears to be rising damp is not structural rising damp, but internal fabric rising damp. What Type of Rising Damp Problem Do You Have? Water damage observed around the internal perimeter of the ground floor and along all internal walls is not always structural rising damp – once the damp proof course of the structure has been checked, and if there are no signs of subsidence or movement of the buildings, it is likely that the damp proof course will be working – it takes a lot for a damp proof course to fail. 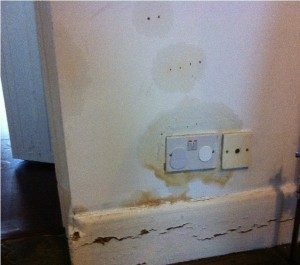 The cause of internal water damage that looks like rising damp is often simply down to poor internal craftsmanship of the floor. When we replace our floors we don’t normally go as far as to rip out the old framework, we normally just replace the top surface. Some floors are built to make up for the either a lack of air ventilation bricks, or to assist in the air circulation beneath the floor, such as floor resting upon sleeper walls for example. Such flooring construction is common all over the United Kingdom – a floor built upon a timber frame work that is designed to rests entirely on the sleeper walls beneath the floor and not make contact with any of the walls in the property at any point. The skirting boards cover the gaps between the floor and the walls whilst leaving a gap between the skirting board and the floor. Those in the house should never look down and see a gap, unless the skirting boards are not there. With this construction, often damp proof courses were not placed between the sleeper walls and the timber frame of the floor – we see this time and time again. In this instance there is often nothing to prevent the wicking of water from the ground, up through the brickwork of the sleeper walls, into the timber frame, and thus into the floor. The floor itself is normally made from treated chipboard or plywood – essentially what has happened is that the water that has absorbed into the wooden floor framework has cause the framework to warp and expand and make contact with the walls in many places. This has enabled the water in the wood, particularly at times during high uptake, to transfer into the walls around the internal perimeter of the building, and cause the water damage patterns that mimic structural rising damp! At Water Damage, we’ll get your home or business back in shape quicker, more efficiently, and cheaper than anyone else in the industry. We’ve become the very best in the UK by getting people’s lives back to normal after a water-related disaster for over twenty-five years. Let our professionals help you get your life together again after the water is gone. One of the first things we will offer you is a swift water removal service to extract remaining water as quickly as possible – however, if it is a matter of damp marks and mould around the bottom of your walls, maybe you need a damp survey and some guidance. Are you looking to make an insurance claim or simply diagnose your grim water damage and staining problems? Building or home contents are then fully dried. We save as many of your valuable documents, books, appliances, electronic devices, and floor coverings as we can. We even have expert technicians, craftsmen and refinishers for fine furniture treatment. Sophisticated measuring and drying equipment is used to ensure the entire structure is thoroughly dry and dehumidified. After we’ve rapidly dried out the affected area we’ll attend to any structural damage repair. We know our customers come to us in less than happy moods – that’s why it’s our goal for every client to leave us that way when we’ve done their job to their complete satisfaction.